Nicholas Dawidoff, in uniform here with bat at the ready at the age of 11, describes his devotion to the Red Sox in a new memoir. A memoir can break your heart. An exquisitely detailed new example of the genre, The Crowd Sounds Happy: A Story of Love, Madness, and Baseball  (Pantheon, $24.95), by Nicholas Dawidoff ’85, describes a childhood of privation shadowed by his parents’ divorce and his father’s mental illness. The spare opening chapter sets the scene. I grew up in a city of dying elms called the Elm City, on a street with no willows named Willow Street. Uncelebrated trees shaded our part of the road, sturdy oaks and mature maples, their branches so thick with leaves that they created a blind curve just before the intersection where the street straightened past our house and made its hard line for the highway. Cars traveled at a clip down Willow Street, especially at night, and because of the curve it was impossible to see them until they’d nearly reached the streetlight glowing out beyond my bedroom window. Yet lying awake under the covers I could hear those cars coming, and never more distinctly than on rainy fall evenings when the wind had blown a scatter of acorns across the pavement. I’d be tensed against my pillow, listening to the whoosh of tires closing fast over wet asphalt, and then, an instant later, a brief, vivid flurry of noise, the rapid, popping eruptions of a dozen flattened acorns, before the whoosh receded into traceless silence as someone else hurried out of town. Long before I knew that I came from a place people wanted to leave, I saw how eager they were to get away. Every so often a car wouldn’t make it to the highway. From my bed I’d hear the familiar swelling murmur of onrushing rubber—it was like nearing a riverbank through parted woods—and…the night detonated in a cry of brakes and tremendous thudding impact.…I’d tug the blankets over my face as my bedroom filled with the hiss of punctured radiators and revolving flashes of hot red light.…My room felt remote, bigger than usual, and every shadow playing along the ceiling terrified me. By morning, when I went outside for a look, all remnants of the accident would have been swept away so that I might have doubted that anything had truly happened were it not for the chips of headlight glass or the laciniated chunk of engine grille that I’d find in the gutter with the acorns. But before any of those investigations, there were hours of the night still to go, and as I tried to calm myself with less upsetting thoughts, invariably my mind turned to my favorite baseball team, the Boston Red Sox. There in the dark I evaluated the feats and virtues of the players I liked best. This was the early and mid-1970s…. 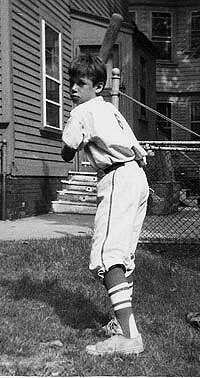 We had no television, did not subscribe to the newspaper, and my bedtime was not long after the evening broadcasts of games began on the radio, so I knew very little about the Red Sox.… Yet my desire for familiarity with them was intense, and I arrived at strong impressions, most of which placed peculiar emphasis on the players’ own boyhoods.